1. Simple and convenient operation. 3. Adjustable sensitivity: Low/Normal Sensitivity. 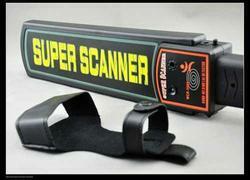 This High Performance Hand Held Metal Scanner MCD-3003 designed to meet the exact requirements of security industry. Typical uses will include body search for offensive weapons in crows control, airport and border security, checking parcels and letters for metal objects and any where that hidden metal needs to be detected. Multizone Door Frame Metal Detector MZ-400 / MZ-600 / MZ-800 / MZ-900 has Four / Six / Eight / Nine respectively separate metal detectors in one frame. The detection coil structure is designed in such a way that it enhances the metal detection process compared to the conventional single zone metal detectors. Metal location on a body of a person is reliably displayed at each zone indication on the side panels. If metal is present in more than one zone, then all the zones with metal are displayed on the representative zone symbol provided on the front panel as well as on the side panels & the zone with the peak metal is displayed on the Bargraph.The detection coil and the microcontroller based control module are housed in an aesthetically designed state-of-the art door-frame which can blend into any sophisticated decor. The Door-frame is designed for quick installation and erection. Walk / Stop indicators above the entrance, both on front and back side, regulate the flow of traffic. All the password protected controls and audio-visual indications are provided on the top of the rear side of the door-frame.Sensitivity of each zone can be set separately to get uniform sensitivity at each zone. Microprocessor technology ensures fast, reliable and precise data processing and operation. 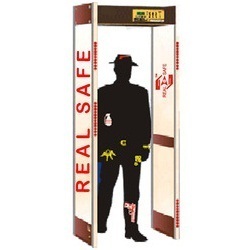 Detects both ferrous and non-ferrous metals, whichmay be concealed on a person.Metal Detectors are backed by prompt and effective after-sales service supported by a team of trained efficientengineers. The minimum down time is achieved by plug-in card assembly system and readily available standardized spares. Four / Six / Eight / Nine zone detection. Microcontroller based with advance SMD Technology, enhances the precision in metal detection. Detector is continuously active, no metal can be tossed without detection. Infrared occupancy sensors for traffic counter (IN/OUT/NET). Digitally controlled sensitivity, threshold & volume. Zone display on side panels of the frame along the length. Multi-tone Audio / Visual indication for metal detection. LCD display for messages, time, date and intelligent counter. Tactile keypad for parameter settings with password protection. Walk/Stop indicators, both on front and back to regulate flow of traffic. Plug in type PCB assemblies for easy maintenance. Computer connectivity with RS232 / USB (optional). SIDDHI Model : VALIDATOR S-15 hand-held type Metal Detector is a rugged, light weight detector designed to detect hidden metal objects, on a person. 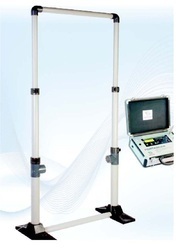 VALIDATOR S-15 comes with an ultra-high sensitivity and is capable of detecting metal as low as 0.1 gm. Effectively detects minute quantities of gold, silver,platinum, brass, copper, mild & stainless steel. Visual indications for Power ON, METAL detection, Battery LOW & Battery charging ON (CHG). Audio indication on Metal detection. Does not affect cardiac pacemaker and magnetic tapes. Intermittent operation 200 hrs for rechargeable battery. 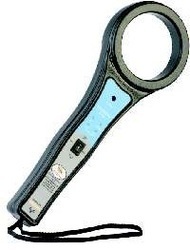 > Detector :9V dry or rechargeable battery (Dual) Continuous operation 90 hrs. on dry cell & 20hrs on rechargeable battery. Weight (without battery) : 230 gm approx. Weight (with both batteries) : 300 gm approx. Police establishments, Industrial security, Banks, Airports, Customs, Prisons, Court rooms, Public buildings, Security services, etc. SIDDHI hand-held type Metal Detector is a rugged, light weight detector designed to detect hidden metal objects, on a person. VALIDATOR S-16 has a large scanning area with an ultra-high sensitivity and is capable of detecting metal as low as 0.1 gm. Fully automatic self adjusting circuit. Operates on disposable dry battery or on rechargeable battery. (Dual Power Supply). 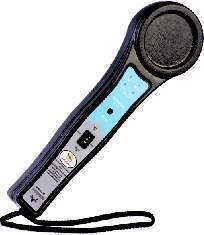 > Detector : 9 V dry or rechargeable battery (Dual) Continuous operation 90 hrs. on dry cell & 20 hrs on rechargeable battery. Weight (without battery) : 290 gm approx. Weight (with both batteries) : 360 gm approx. Police establishments, Industrial security, Banks, Airports, Customs, Prisons, Courtrooms, Public buildings, Security services, etc. SIDDHI PORTASCAN PS-320 is a portable type of walk through metal detector and is designed for temporary & quick installation for security checks. Microprocessor based with advanced SMD Technology. Detects ferrous & non-ferrous metals, even concealed in ferrite. Separate LED indication for Ferrite detection (optional). Search coil housed in Telescopic extended rigid PVC frame / collapsiblerigid PVC pipe (optional). Control unit with advance features fitted in a sturdy industrial brief case. Sensitivity levels from 1- 9, settable through tactile switch. Multi-tone Audio / LED bargraph Visual indication for metal detection. IR sensors to avoid false alarm indication for metal movement out side the frame. IN/OUT/NET counter.• Walk / Stop indicators, to regulate the flow of traffic (optional). Mains / Battery operated with in-built battery charger. Canvas carrying case for easy transportation. Hard carrying case for easy transport of complete assembly(optional). > 12V Maintenance free battery backup with in-built charger. Audio indication : Multi-tone, indicating quantity of metal detected. Sensitivity : 9 levels, user selectable. Search coil :800 x 2000 mm approx. Control Unit :370 x 270 x 120 mm approx. Weight : 8 kgs approx. Defence services, Police establishments, Industrial security & Security services.